We had no hot water for first 3 days. After we complain and complained. They finally moved us. Don’t know why it took 3 days to take care us. We took cold shower for 3 days. I like the fact that the hotel was right across the street from the beach. The information desk personnel were not trained properly. Very noisey. Party at the hotel next door-had a hard time getting to sleep. Hotel was very nice. Staff was very friendly and helpful. It was great to be close to the beach. We enjoyed 3 nights here. Ocean front & convenient location. The restaurants on site were nice. The room cleaning service & bell staff were fantastic. The most of the concierges were very friendly & professional. Only one dissapointmet: In the room, only camomile & black tea (1 tea bag) were available, so I asked a concierge at the front dest if there were other tea options such as greet tea. Her reply was "you can go & get it at ABC store".....seriously? In the end, a room cleaning staff brought green tea bags for me. Other than this experience, we appreciated all the service here. I have a room with 3 beds and 2 bathrooms though I was alone. Nice hotel very close to the beach. Bed was pretty hard and pillows very flat. Great location across from the beach and walking distance to shops and restaurants. Less than 10 miles from the airport. Car rental and concierge on site to help plan/give info on excursions. Plenty of public choices for transportation. Staff were very friendly and provided excellent customer service. It is located toward the end of the Waikiki Strip which I liked. Just a couple of blocks away from greenery and shade trees to walk and run through. Near zoo and aquarium(good for smaller children). Near a covered hut with on a pier which was nice to spot fish and watch sunrises/sunsets on. Very close to Diamond Head to take a hike. Nice balcony and view of ocean. Comfortable bed. Nice hotel. Ocean view room was fantastic. Friendly staff. Lots of common area to relax in. Convenient stores close by. Great prime rib restaurant in house. Walking distance to beach, more restaurants and shops. Family vacation had a great expericence rooms clean comfortable and relaxing.Staff was helpful and kind. All of the hotel was beautiful. The carpet could be updated. Rest was excellent. Good location, close to the beach and shopping center. Close to ocean many places to eat. I was disappointed with lumpy bed and water for shower was warm, had to turn full blast hot to get that. Kuhio beach grill prime rib was tough meat rest of buffet was delicious and so was breakfast. On breakfast we had regular menu so we would not over eat. Was still enjoyable place to stay. Hotel staff was very attentive to all our needs. Concierge staff was amazing in coordinating all of our excursions during our stay. Gym was large, clean, and modernized. Plenty of pool space for adults and kids. Solid location for me and my 2.5yo daughter - literally a block from the beach and the main drag with shops, restaurants, etc., and about a 5min walk to the Honolulu Zoo. Hotel lobby and pool were just okay. Rooms look outdated, but fine - especially if you don't plan to spend much time in them. Worth noting - they "upgraded" us to a beach view that shared a wall with the elevator bank. We literally heard and felt the elevators EVERY time they passed through - sounded like a huge wind tunnel plus screaching... it was ridiculous. When I later complained, they said the staff should have notified me and that those elevators are shut off from 11pm-6am. Gee thanks... since my daughter goes to bed at 7:30pm, that really didn't help me. She woke up EVERY time the elevator came by. So heads up that if you plan to sleep before 11pm or later than 6am (seems EVERYONE should fall into one of these categories??!!!!!! ), demand to get moved. 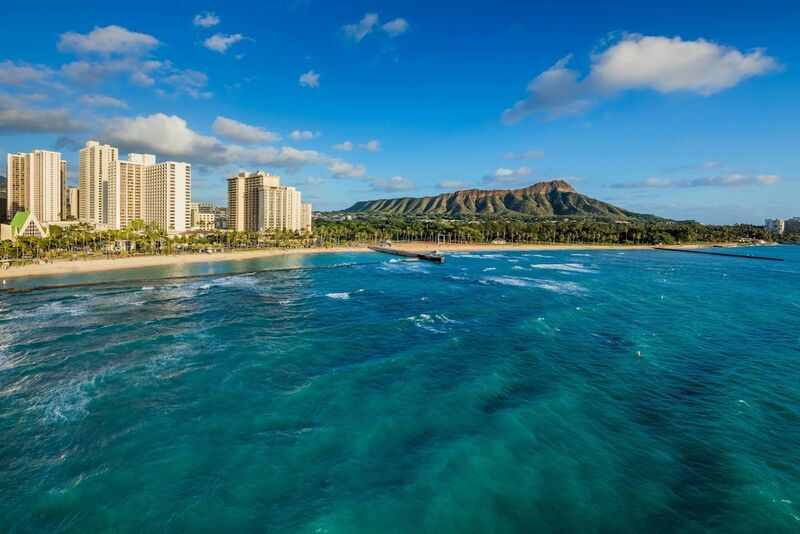 Located in Waikiki, Waikiki Beach Marriott Resort & Spa is within a 10-minute walk of popular sights such as Honolulu Zoo and Waikiki Beach. This 1310-room, 4-star resort has 2 outdoor pools along with a full-service spa and 5 restaurants. There are multiple options for onsite dining with 5 restaurants, including Kuhio Beach Grill, which specializes in American cuisine and serves breakfast and dinner, and Moana Terrace with pleasing ocean views. Satisfy your hunger without leaving your room with room service, or quench your thirst with a beverage at the bar/lounge or coffee shop/café. Buffet breakfast is offered for a fee each morning from 5:00 AM to 11:00 AM. A 37-inch Smart TV comes with satellite channels and Netflix, and guests can stay connected with WiFi and wired Internet. Beds sport premium bedding and the bathroom offers a hair dryer and free toiletries. Other standard amenities include a balcony, a refrigerator, and a coffee maker. Guests of Waikiki Beach Marriott Resort & Spa have access to a full-service spa, 2 outdoor pools, and a 24-hour fitness center. Valet parking is offered for USD 50 per day. Multilingual staff at the 24-hour front desk can assist with concierge services, dry cleaning/laundry, and securing valuables. Other amenities at this beach resort include a spa tub, free WiFi in public areas, and conference space. Buffet breakfast is served daily from 5:00 AM to 11:00 AM for a fee. Kuhio Beach Grill - Ocean-view restaurant and bar specializing in American cuisine. Open daily for breakfast and dinner. Moana Terrace - Poolside family restaurant and bar specializing in American cuisine. Open daily for lunch and dinner. Sansei Seafood Restaurant - Sushi bar specializing in sushi. Open daily for dinner. D.k Stead House - Ocean-view steakhouse specializing in American cuisine and serving dinner. Open daily. Arancino di Mare - Restaurant specializing in Italian cuisine. Open daily for breakfast, lunch, and dinner. The resort has 2 outdoor swimming pools and a spa tub. Other recreation options include a 24-hour fitness center.